The cavity caused by the bacteria and its products has a great bearing on the future of the tooth and the pulp. If the decay is progressing slowly then the pulp (the nerve) has time to protect itself. It can make harden form of dentine called sclerotic (calcified) dentine. However, it makes 1mm of this protective dentine every six months. With this process the nerve space gets smaller as it retreats away from the irritation and the infection. In this scenario there is still hope that the nerve will still be alive. But if the decay’s progress is faster than the nerve can handle it, inflammation builds up. Unfortunately, in a deep cavity, there is no way of really knowing directly how the pulp is faring. Cleaning out the decay and placing a filling is also an irritant to the nerve. It’s a “Catch 22” situation. Doing nothing the decay will progress into the nerve but doing something may cause it to become more inflamed. The dentine consists of mini tubes which get larger the closer it gets to the pulp. This means that it gets easier for bacteria to get to the pulp the deeper the cavity. This is why sometimes the nerve dies despite all the dentist efforts. An xray does not reveal the early stages of pulpal death. Occasionally, on cleaning out the decay, the nerve can become exposed. If the symptoms were minimal and the exposed nerve is not bleeding, then a PULP CAP can be placed. This is a dressing that protects the nerve and provides an environment for the nerve to make sclerotic dentine. The success rate is about 40%. Conversely, if there is prolonged ache or the exposed nerve bleeds then the success rate is NIL. The pulp will not recover, and will need to be treated either by root canal treatment or extracting the tooth. 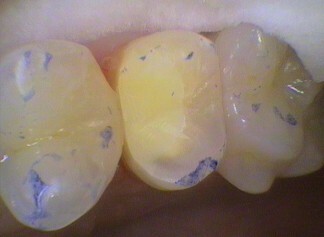 The cavity is prepared for a filling by removing the soft infected decay and then carefully the firmer affected decay. 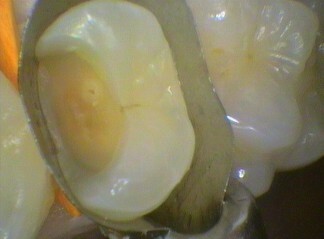 Weakened enamel is also removed. Any cracks in the tooth or weakened cusp (points) need to be protected by the filling. In a future blog, we will discuss what goes into a filling. Next part of this series will be: What is decay? End of the nerve – too late!